The big-box retailer released its much-anticipated Black Friday circular and announced plans to open at 10 p.m. on Thanksgiving Day. NEW YORK (CNNMoney) -- They may as well call it Black Thursday. 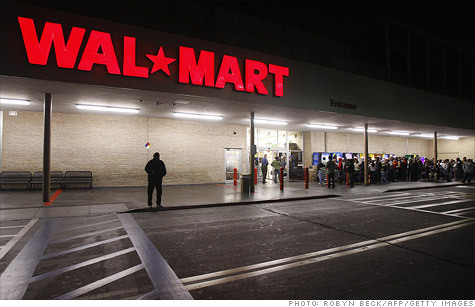 Joining a slew of other national retailers, Wal-Mart said it too will open its doors nationwide on Thanksgiving night. Not to be one-upped by Target (TGT, Fortune 500), which recently announced it would open at midnight on Black Friday, Wal-Mart (WMT, Fortune 500) said it will kick off its Black Friday deals at 10 p.m. on Thursday. "Our customers told us they would rather stay up late to shop than get up early, so we're going to hold special events on Thanksgiving and Black Friday," Duncan Mac Naughton, Wal-Mart's chief merchandising officer, U.S., said in a statement. Starting at 10 p.m., Wal-Mart is offering doorbuster deals on toys, clothes and home accessories like $5 Barbies marked down from $19, jeans for less than $10, children's pajamas sets for $4.47 and a Black & Decker Coffeemaker for $9.44. Then at midnight, the retailer said it will begin discounting electronics as well. Deals include a Samsung 51-inch plasma TV for $498 down from $649, a Kodak 14 megapixel camera for $49 and a Magellan GPS for $69, marked down from $89. Another round of discounting will start at 8 a.m. and continue throughout the weekend, Wal-Mart said. Among those deals will be Goodyear tires starting at $59, a Vizio 42-inch 3D LED Wi-Fi HDTV for $598 and a selection of DVDs for $1.96 each. This is the earliest look at the retailer's highly anticipated doorbuster deals, which are not usually released until the week of Thanksgiving. Last week, the retailer said it would give customers who sign up at Walmart.com or Facebook.com/Walmart an even earlier preview of its Black Friday sales. For hard-core deal hunters, the retailer is also offering a downloadable map for all of its stores on its Facebook page so they can map out their route before they start shopping. As the holiday season gets underway, retailers will have to work harder to motivate shoppers -- even on one of the biggest shopping days of the year, said Tom Julian, president of Tom Julian Group, a retail consultancy in New York. "I expect there will be more Thanksgiving openings from other groups as a result," he said. "It's a marketing maneuver for those that really want to own Thanksgiving to Black Friday." Best Buy (BBY, Fortune 500), Macy's (M, Fortune 500) and Kohl's (KSS, Fortune 500) have already announced openings at midnight. But getting shoppers in the mood to spend has been particularly difficult for retailers, as Americans feel increasingly protective of their discretionary dollars. Last year, Black Friday sales totaled $11.8 billion, according to a report by research firm IBISWorld. This year, sales are expected to increase by only 1.2% to just under $12 billion. Wal-Mart has also announced a number of additional shopping incentives in recent weeks, including price matching from now until Dec. 15, layaway on purchases over $15, free shipping on most Walmart.com products, no interest on Wal-Mart credit card purchases if they are paid for in full within six months, and a 10-cent discount on each gallon of gas bought at participating Murphy USA or Wal-Mart stations. Are the rich finding the true meaning of Christmas?